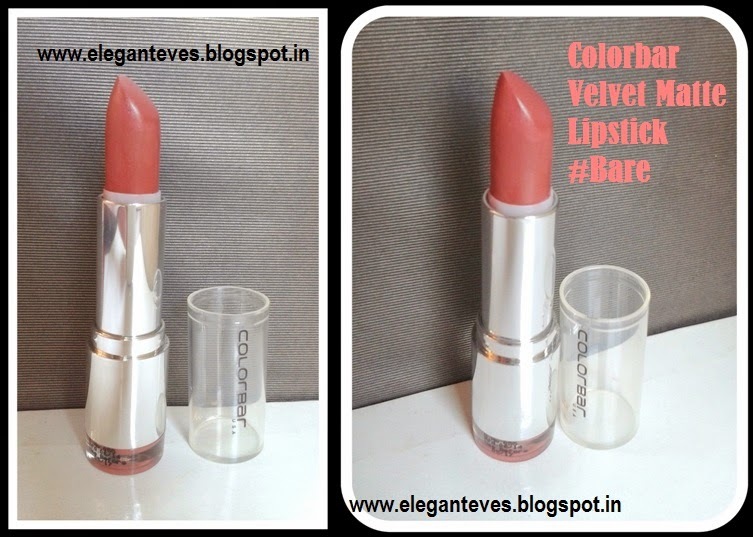 Product Description: For a rich lip-colour with a creamy shine, the Velvet Matte Lipstick, available in 45 stunning shades infuse the lips with vibrancy. Its unique 2-in-1 formulation gives the lips a creamy, yet matte finish. A one of a kind product in India, it has super softening agents that give the lips a soft and supple appearance while keep them nourished with Vitamin E. Staying on up to 5 hours on application, the Velvet Matte Lipstick can be further accentuated with lip gloss and lip liner. Packaging: The lipstick comes encased in a pretty silver coloured tube with a transparent cover. The packaging is functional and the colour band at the bottom of the lipstick shows the exact lipstick shade inside. This makes it useful to spot in the vanity box. 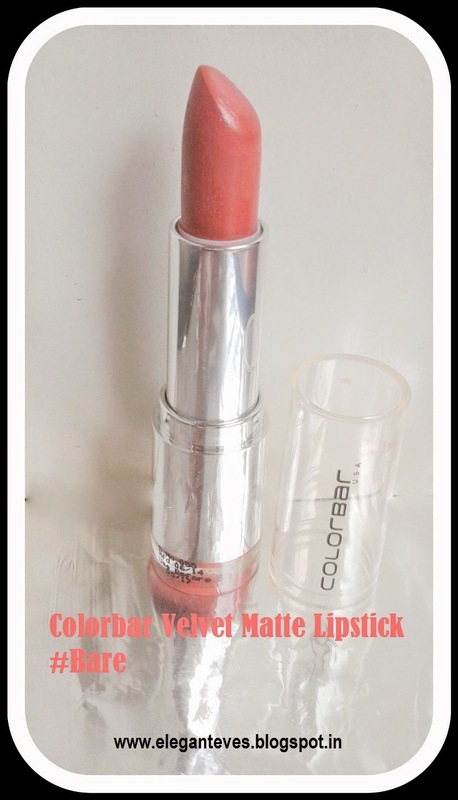 My take: I have used Colorbar products earlier and have been pleasantly surprised each time. “Quality products in affordable price range” sums up the brand. I had heard great reviews about the Velvet Matte range and was intrigued to try this unique kind of matte finish which claims to have a soft and moisturized final effect unlike the crayon-like matte lipsticks some other brands have to offer. > The texture is soft and smooth and the lipstick glides on smoothly with no tugging or pulling. > No overpowering fragrance. It has a normal sweet ‘typical lipstick’ fragrance. > The finish is not glossy but not completely matte either. I would rather call it a lipstick with a ratio of 2:1 of matte and cream respectively. > The shade is unique mainly because this would show up as a different shade on ladies with different complexions. It is mainly a mix of pink, brown and peach in the ratio of 3:2:1 (I know I am using too many ratios here, but I just HAD to clarify!) It would show up as a beautiful warm pinkish-brown on fair-medium skin and a deeper peachy brown on richer complexions. On me it is a perfect beige-pink. 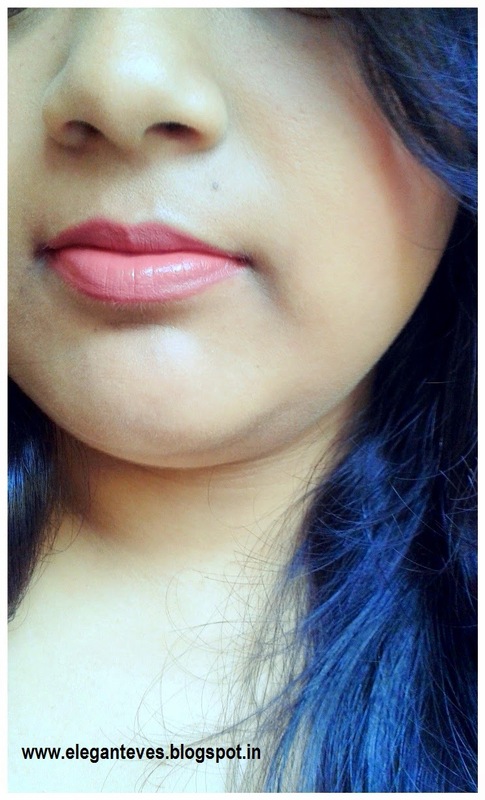 > The pigmentation is super awesome and one swipe covers all pigmentation in lips. The coverage is opaque. > The staying power is average. It retains it creamy-matte finish till 2.5hours on me after which the creamy finish fades and the tint remains for another 2 hours. But of course, the lipstick fades away faster if I snack in between. However, the staying power would definitely increase if a lip liner is used all over the lips before application of the lipstick. 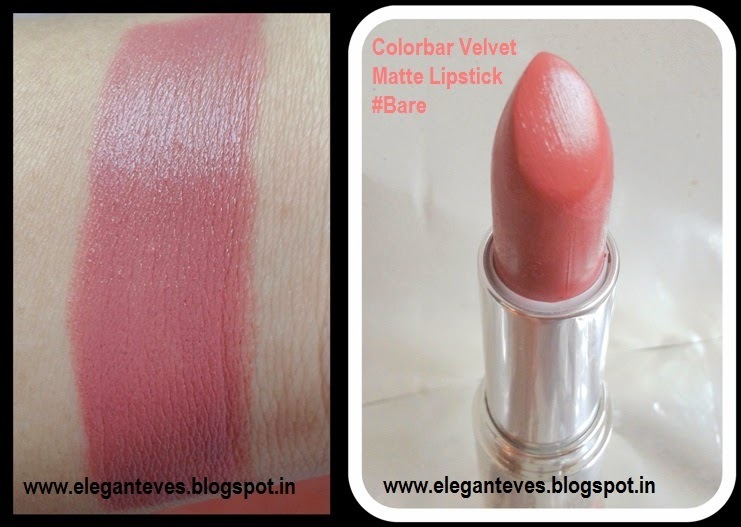 Recommendation: Elegant Eves definitely recommends this lipstick to everyone who is searching for a perfect MLBB shade. It would suit all complexions and is worth a try!